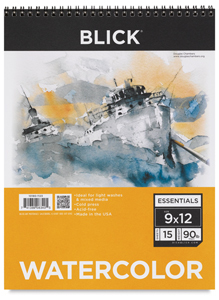 Priced for the beginning artist, these economical pads contain 15 sheets of acid-free Blick Essentials Watercolor Paper - ideal for light washes or for perfecting techniques. The paper is easy to rework, making it perfect for combining wet and dry media. 90 lb. These pads contain 15 sheets of lightweight, acid-free paper that can be used for light washes or for perfecting techniques. The paper is easy to rework, making it perfect for combining wet and dry media. The pads are available in three sizes, in both tapebound and spiral-bound formats. 90 lb (192 gsm).